What's in a name? 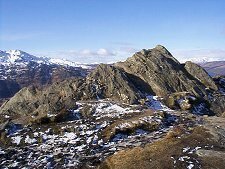 The Ordnance Survey show this little peak as Ben An, or, in brackets as Binnein. 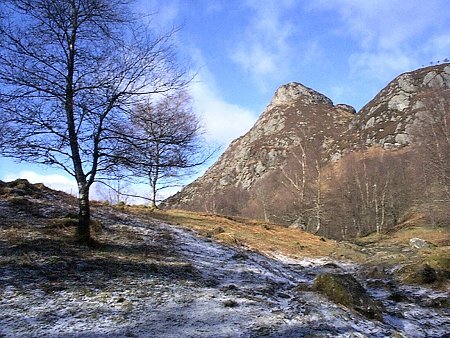 The best authority on the subject, Peter Drummond in his Scottish Hill and Mountain Names suspects the origin to be Am Binnean, or small pointed peak: a perfect description. The origin of the confusion seems to be Sir Walter Scott, who wrote of it as Ben-an. 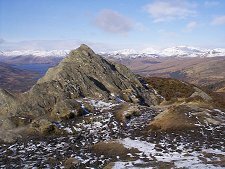 To add to the confusion, Ben A'an isn't really a separate mountain at all; merely a point of rock on the south side of the less well known Meall Gainmheich, which at 564m is 110m higher than Ben A'an, but much less visited. 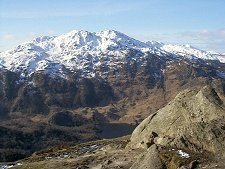 There is a path approaching Ben A'an from Loch Katrine in the west, but the best known route is the one described here, from the south east. 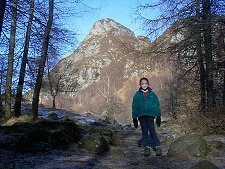 It starts in the large car park on the edge of Loch Achray about two miles west of Brig o' Turk. Having crossed the A821 you follow the the good path up through the forest that, in recent years, has obscured the view of Ben A'an from below. 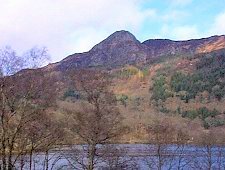 This makes your first sight of Ben A'an's unfeasibly pointy top still more striking when it emerges through the trees. As you approach a summit cone that offers a range of rock climbing opportunities, it is less immediately obvious how it is accessible to the mere walker. In practice, though steep in places, the route that bypasses the cone to its right is readily accessible to pedestrians. This cheats Ben A'an's rocky face by dodging around its back to the bealach where it joins the bulk of Meall Gainmheich, then bringing you up to the top from the rear. The total route distance to the top is rather under 2km. Ben A'an is (arguably) 454m or 1,488ft high, and the top is under 2km from the car park.